Eltra Africa supplies Eltra Analyzers as well as all other analytical equipment. Contact Eltra Africa on instrumentsales@eltra-africa.co.za or call 011 818 6600 for more information. With ever increasing socio-economic and geo-political demands, the use of secondary fuels in cement manufacture is a well-established practice for reducing both costs and CO2 emissions. The depletion of resources, combined with an increasing demand for primary fuels such as oil, gas or coal, make it paramount for energy consuming industries to search for alternative energy sources. Usually, these alternatives are non-fossil fuels and over the past few decades industries with high energy consumptions have made greater advances in the use of alternative fuels. The use of these so called secondary fuels is therefore becoming increasingly important. Secondary fuels are usually solid fractions of domestic or industrial waste which cannot be recycled. Approximately two thirds of the CO2 released in the cement industry is fixed by the process, leaving one third that could be reduced by various methods such as improved plant control, more efficient movement of materials, and the use of secondary fuels. Controlling the CO2 emissions and preventing the release of pollutants are important objectives. In addition to these environmental issues, the plant operators also have to take care of commercial aspects, with the most important being to derive as much energy as possible from the secondary fuel. Consequently, extensive quality control of secondary fuels is crucial. Analyses to evaluate the quality of secondary fuels include the determination of calorific value, residual moisture or contamination with pollutants (e.g. sulfur, mercury). The furnace used to produce clinker has no waste products and therefore it is crucial to understand the chemical composition of secondary fuels as this could directly impact the quality of the cement produced. For the production of clinker it is also important to characterize the amount and composition of the released ash. Depending on the subsequent analysis, sample quantities of only a few grams are required. These have to be ground to a size of 0.2 to 1 mm to ensure representativeness and facilitate the release of the properties to be determined. In addition to these requirements, the material properties must not be altered during the grinding process, i.e. there must be no contamination and the volatile components have to be preserved. Residual waste is a very heterogeneous mixture of solids. Unsorted, it may contain a variety of plastics, cellulose, ceramics and metals, singly or combined, with different breaking properties. On-site sampling methods, such as those specified for pourable bulk materials, cannot be applied in view of the composition of the substances involved. Automatic sampling tools do not fulfill their purpose in this case therefore sampling from a waste heap or a waste transport consignment is largely a manual process. The laboratory sample must be prepared in such a way that its qualitative composition comes as close as possible to the total quantity to be evaluated. During on-site sampling, care should be taken to ensure that metallic parts are separated as they represent a specific problem for further mechanical processing, especially for the crushing devices involved. A complete laboratory waste sample was subjected to an initial crushing process, as far as possible in an air-dried condition. This was done in RETSCH’s powerful SM 300 cutting mill, which is ideal for the pre-crushing of such heterogeneous mixtures with different breaking properties. With the cutting rotor’s tangential cut and the mill’s high-powered drive, textile and leather parts, plastics and ductile metal cans are cut up just as effectively as abrasive electronic scrap and non-metallic shredded car parts. Although the cutting tools consist of hardened steel and tungsten carbide there are limits to this cutting mechanism particularly when steel and iron parts are involved; the use of a magnetic separator should be considered before material is fed into the mill. The final fineness is mainly determined by replaceable bottom sieves with defined aperture sizes. In only one minute 50g samples were pre-crushed at 3,000 rpm using the SM 300, a parallel section rotor and a 4 mm bottom sieve, to achieve predominantly 4mm particles. A cyclone was used to enhance discharge of the very light plastic parts, preventing material separation during pre-crushing. Selection of a suitable fine-grinding mill is based primarily on the condition of the pre-crushed material mixture, the feed quantity and the required analytical fineness. Due to the unfavorable breaking properties displayed by most residual waste samples it is extremely difficult to achieve the analytical fineness which can be achieved in the areas of mineralogy and agrology. Grind sizes <1mm are generally adequate for the most important analyses on waste samples. Waste mixtures consisting mainly of cellulose and plastic residues with a tough fibrous product structure are best pulverized with rotor mills. Retsch’s Ultra Centrifugal Mill ZM 200 with its patented cassette and easy handling system is ideally suited for this job. An exchangeable ring sieve is placed around a horizontally rotating rotor. The material to be ground is fed into the mill through a hopper and is ground between the rotor and ring sieve by impact and shearing. The aperture size of the ring sieve determines the degree of fineness. Experience shows that aperture sizes of 0.5 or 1.0 mm are fully adequate for obtaining analytical fineness. To improve the breaking properties of the soft, ductile and elastic components of the pre-crushed sample, it was mixed with dry ice for embrittlement before being fed into the mill as when ground at room temperature these materials would melt in the grinding chamber and clog it. A final fineness of 1mm was achieved when 28g of the pre-crushed sample was pulverized in the ZM 200 using a 12-teeth rotor, a 0.5 mm ring sieve and the cyclone for better sample discharge. Routine chemical characterization of secondary fuels in a quality control laboratory encompasses determination of the carbon and sulfur content, calorific value, moisture and ash content, followed by xrf analysis of the ash. The elemental and thermogravimetric analyses described below were carried out with two secondary fuel samples which were previously processed in a cutting mill and ultra centrifugal mill. The mean particle size of one sample was 4mm, the other 1 mm. Before starting elemental analysis both samples were dried to achieve a constant mass in a CARBOLITE AX30 drying oven at 105 °C. This procedure ensures that residual moisture will not affect the precision and accuracy of the analysis. To ensure reliable determination of the element concentration multiple measurements are required. Approximately 80mg of the dried samples had been analyzed five times with ELTRA’s CHS-580 by combustion at 1350°C and measurement of the released gases in infrared cells. 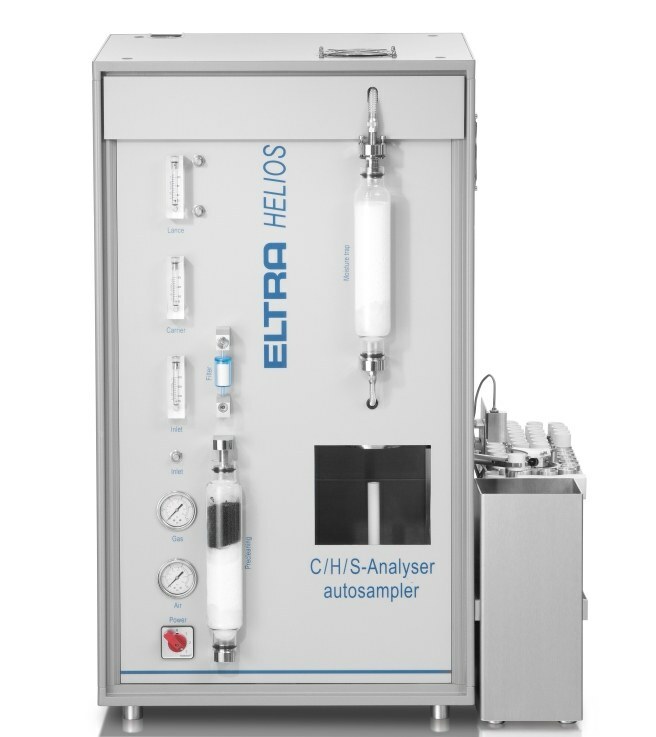 In addition to the carbon and sulfur content the ELTRA CHS-580 also determined the hydrogen content in the sample. As hydrogen forms water during combustion this has to be removed from the furnace. This evaporating process consumes energy which cannot be used in the heating process so as a consequence the calorific value of secondary fuels decreases with the amount of hydrogen bound in the fuel. Table (1) shows the result of the C, H, S determination of the secondary fuel samples. Measurement of the element concentrations is possible in one analysis and takes approximately 180 seconds. The standard deviation of multiple measurements decreases significantly with the fineness of the sample. For secondary fuels a sample size of approximately 500 μm – 1000 μm is ideal. Further size reduction does not usually improve the precision of the measurements. The moisture and ash contents of the secondary fuels were determined using CARBOLITE’S high performance AX30 drying oven and AAF 11/18 ashing furnace, as well as with ELTRA’s TGA Thermostep. This thermogravimetric analyzer is controlled by a computer and measures the ash and moisture content automatically without manual intervention. The unit consists of a programmable furnace containing a multi-position carousel and an integrated balance. It is possible to analyze up to 19 samples in one run, with each sample filling a single ceramic crucible. Higher sample weights of secondary fuels can be processed with CARBOLITE ovens and ashing furnaces. Table 3 shows that higher sample weights increase the precision for ash and moisture determination even for the larger sample with 4 mm particle size. The moisture content of this sample was determined in a CARBOLITE AX30 drying oven by pre-weighing the sample, putting the sample in the oven for 3 hours (105 °C) followed by cooling in a desiccator and re-weighing. For determination of the ash content the dried sample was placed in the CARBOLITE AAF11/18 ashing furnace for 3 hours at 1000 °C followed by cooling in a desiccator and again re-weighing the sample. The AAF 11/18 furnace is supplied with a two tier rack and tray system to optimize the number of samples for the given chamber size and promotes ashing by introducing a pre-heated airflow into the chamber. For reliable characterization of secondary fuels and application development reproducible sample preparation for chemical analysis is essential. Samples with larger particle sizes usually yield less precise results in chemical and thermogravimetric analysis and greater sample weights can compensate the heterogeneity of inhomogeneous samples for ash and moisture determination with ovens and furnaces. “Secondary fuels” cover a wide range of sample materials, and the parameters for sample preparation and chemical analysis differ greatly depending on these fuels. Refuse-derived fuels (RDF), shredded waste fuels (SWF), solid recovered fuels (SRF), solid shredded waste (SSW), used tyres, meat and bone meal (MBM) or biomass fuels are defined as secondary fuels but have to be processed and analyzed in different ways. Together RETSCH, ELTRA and CARBOLITE offer a wide range of suitable products and expert know-how to find the optimum solution for the preparation and analysis of secondary fuels.